Oh a twin bed ... how I love thee. I am not sure if I am captivated by them because I had one until I got married or because my grandparents had them in their guest room but I am a huge fan of a twin bed. I can recall watching the Brady Bunch and noticing the beds shared by Jan and Marsha. The simpleness of the look, the shared dresser in between. I loved it immediately. 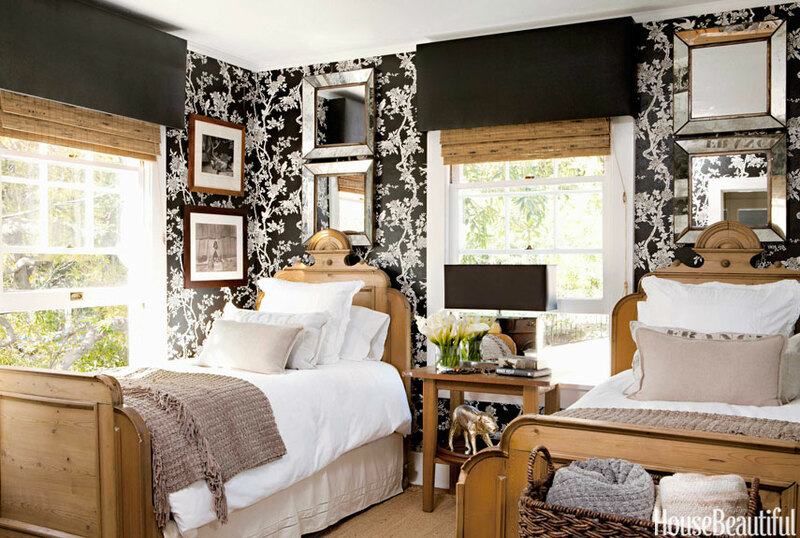 I have noticed they are making a huge comeback in the design of a guestroom. Providing versatility for the guests I can easily see why people are attracted to them. Our guest suite contains a queen bed, but the more I think about the space I am excited about the possibility of trading the bed for the ones in our middle son's room. And since I am a visual girl ... I have searched the internet for the best examples of twin beds in a guest room. I love the symmetry each of these rooms provide. 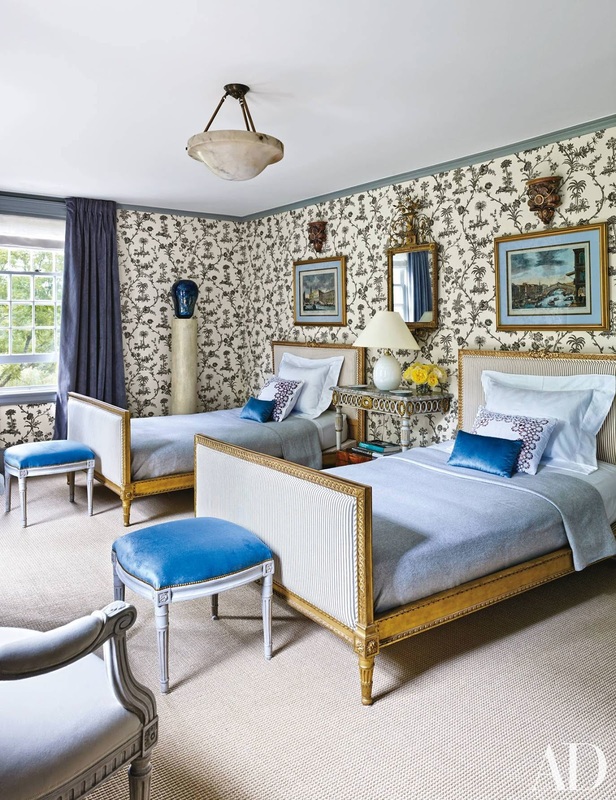 Two beds, two lamps, two fabulous art displays above the bed, two amazing beds filled with incredible linens ... I say #yesplease to it all! Having seen this guest room in person many times I can tell you this photo doesn't do it justice. 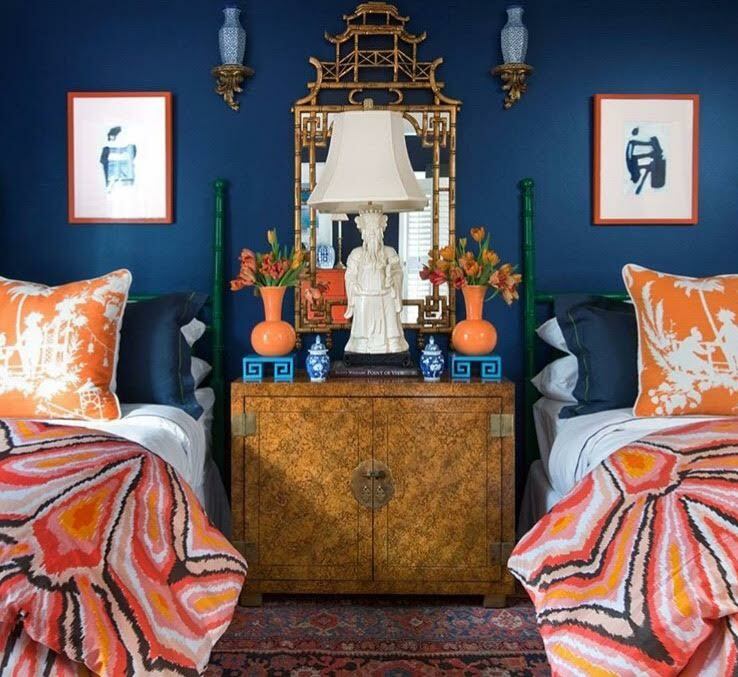 Those walls, the bold blue mixed with orange, the details. It is all incredible! These beds ... I can't say enough about them. 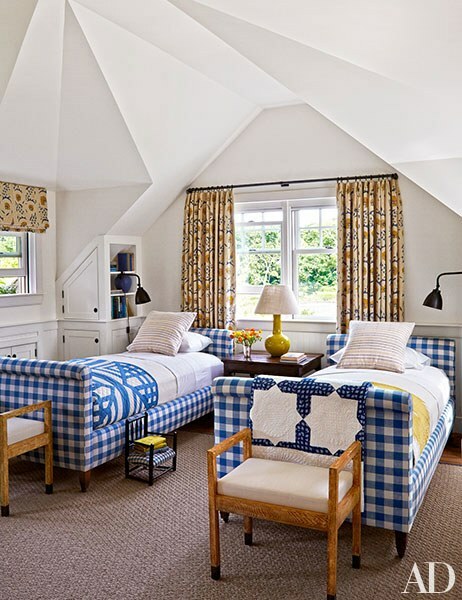 I am a gingham girl and of course I am a huge fan of this room. The mix of pattern speaks to me and the nooks on the side with the incredible lighting. Adore, just adore it all. This room is absolutely fabulous, but I think I would love anything blue and white with that incredible wallpaper. The beds are amazing and I love the sitting area in the corner. What a perfect set up for a guest room. Yes, yes and yes!! I have loved Meg Braff for quite a while and her style is perfect for me. 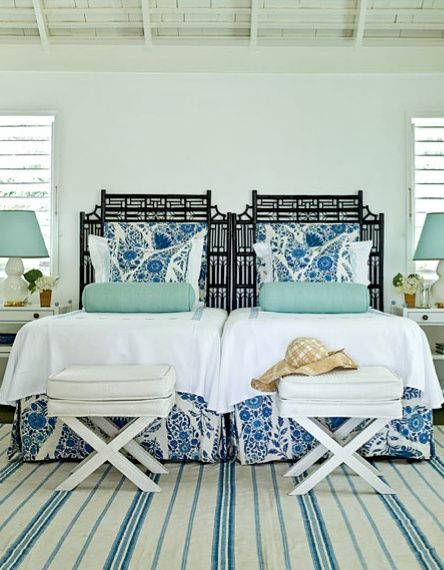 This bedroom in a Jamaica beach home is fabulous. I love how she pushed the twins together to create a king feel but clearly out of two twin beds. 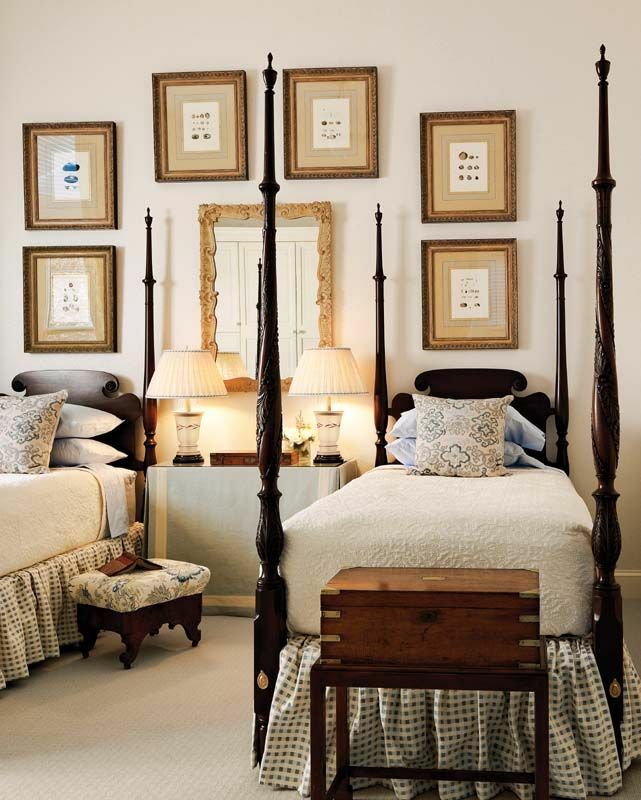 Those headboard are everything and the symmetry created here is perfection. Can I just add it to my shopping cart please? 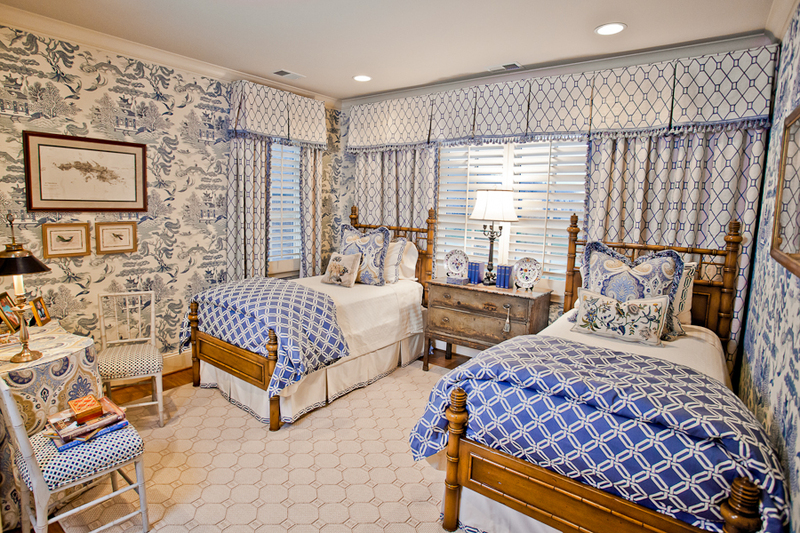 This bedroom speaks to my very traditional side. Those beds are amazing and the art display makes the room for me. I love hanging lots of art and things on the wall, as you well know. Perfect and timeless ... nothing wrong with either of those! 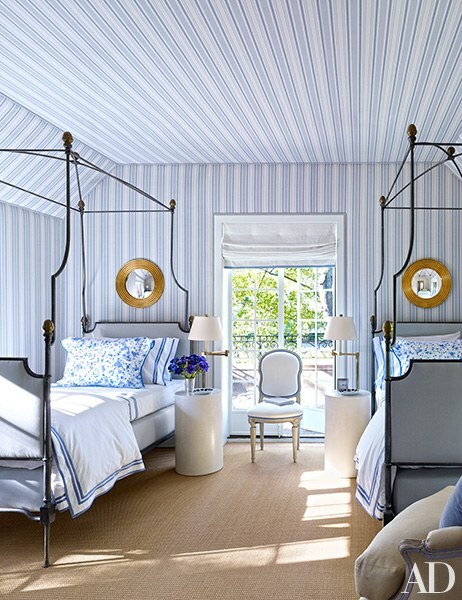 This guest room with the striped walls and ceilings makes me want to move in and possibly stay forever! 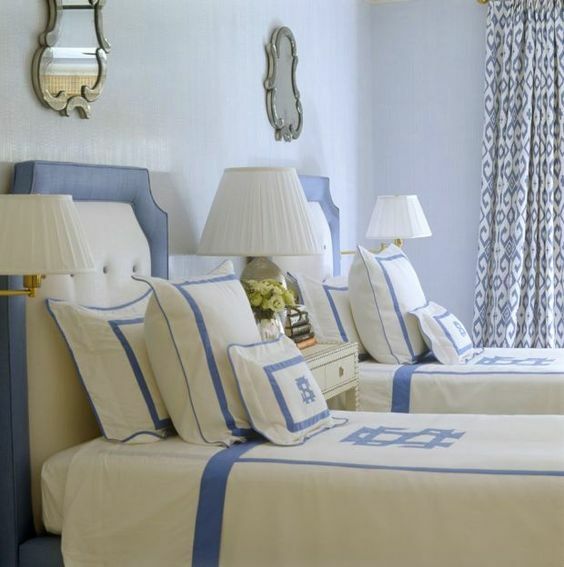 Those beds by John Rosselli & Associates are just about everything! I am a sucker for a foot board! thank you for posting this.. i still have twin beds in my sons room - they're long gone and i hate to give them up and wanted spruce up the space.. this is the inspiration i needed..
Any time someone makes a large investment in an item or service that can be expensive in nature; you should consider finding ways to protect that investment. When you purchase a new car, you often purchase full coverage insurance to make sure that if anything happens your investment is covered. Wow! These twin bed bliss design are totally awesome! If I have twins, I will definitely love to create this twinees atmosphere at home. Just like the ones posted via http://resumes.expert/ which are all gorgeous.